ONCE YOU'RE HERE, YOU WON'T WANT TO LEAVE! GORGEOUS WATER VIEWS FROM EVERY ROOM ON THE BACK OF THE HOME. IMPRESSIVE TWO STORY, OPEN FOYER TO FAMILY ROOM AND GREAT ROOM WITH FIREPLACE. GOURMET KITCHEN WITH BREAKFAST AREA AND ADJOINING FORMAL DINING. SUNROOM AND FULL BATH COULD BE FIRST-FLOOR BEDROOM. GENEROUS MASTER RETREAT WITH TRAY CEILINGS AND DOUBLE-SIDED STONE FIREPLACE, SITTING ROOM, AND A DESIGNER WALK-THROUGH CLOSET TO MASTER BATH WITH VIEWS OF THE WATER. TWO STAIRCASES ALLOW FOR SEPARATED LIVING AND THE THIRD-FLOOR BONUS ROOM COULD BE A GYM, OFFICE, THEATER, OR PLAYROOM. 3RD CAR GARAGE BUILT FOR A BOAT. ONE OF THE LARGEST LOTS IN THE NEIGHBORHOOD AT 1.26 ACRES AND GRANDFATHERED IN FOR A FUTURE DOCK, WITH AN INGROUND POOL, LARGE DECK, AND STONE SURROUND FIREPIT. TAKE A MINI-VACATION RIGHT HERE, EVERY DAY! Send me more information about the listing at 136 Whimbrel, Suffolk, VA 23435, MLS# 10240665. 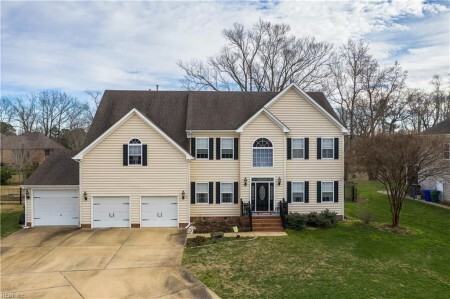 This 5 bedroom, 3 bathroom home located at 136 Whimbrel, Suffolk, VA 23435 has approximately 3,700 square feet. It is currently listed for 499000.00 and has a price per sqft of $13,486. This home is currently Active under the MLS#: 10240665. It is listed by Fit Realty. 136 Whimbrel, Suffolk was built in 2003. It has Garage Att 3+ Car, 4 Space, Multi Car, Driveway Spc parking. The kitchen includes Dishwasher, Disposal, Dryer Hookup, Gas Range, Refrigerator, Washer Hookup. 136 Whimbrel is part of the Creekview neighborhood located in 23435.